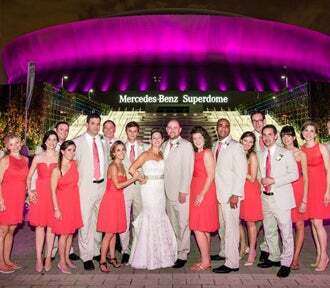 Upgrade your event experience at the Mercedes-Benz Superdome. Host your convention in a venue that has become one of the most recognized landmarks in America. The Superdome is a blank canvas ready for creative programming ideas that will bring a unique experience to your attendees. For general sessions, the tiered seating produces excellent sight lines, ensuring that each attendee has the best seat in the house. The Superdome has the space and the technology to take your meeting and presentation to the next level. Total space: Main Arena Floor maximum floor – approximately 162,500 sq. ft.
Additional meeting space located on the Ground Level in the two Premium Bunker Club Lounges and in the four Club Lounges on the 200 Level. To research date availability or to receive a customized proposal, please call the Sales Department at (504) 587-3663 / (800) 756-7074 or email [email protected]. Everything you need to know about the venue is found in the below documents. Browse through site maps, facility specifications, back of house space layouts, etc.